The Spirit-class MSA1 was a remarkable step forward in starfighter design. The engineers responsible for the project decided to combine a sleek, tapered fuselage with two stabilising solar panel wings, combining the most notable features of two of the galaxy's most recognisable starfighters: the N-1 Starfighter and the Galactic Empire's TIE/ln Fighter. The Spirit-class design maximised its speed by removing the weight of weapons and fuel systems, and by relying on the two large engines under its wings. These two innovations allowed the ship to travel at speeds that rivalled some of the fastest fighters in production at the time. 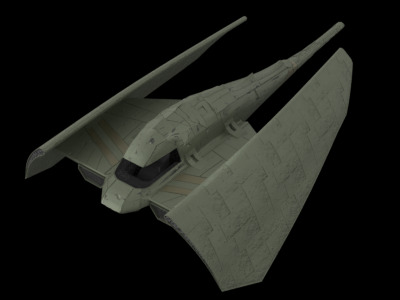 Because of its high top speed and advanced sensor array, the Spirit-class fighter was most often employed as a reconnaissance ship. Its streamlined shape and wings allowed it to maintain speed and stability in open space and atmospheric conditions, while the solar-panel wings enabled the ship to remain away from its base long after more traditional fighters would need to be refuelled. Despite its innovative design, the Spirit-class MSA-1 was never mass produced. Legal disputes between the MSA-1's engineers, the Galactic Empire, and several patent holders for N-1 components halted production after the first batches left the shipyards. While additional batches were made by more clandestine means, the firm that designed the MSA-1 was ordered to secure the ship's plans in its vault until the lawsuits were resolved. While verdicts were never reached in the various lawsuits, the ship continued to be sold on the secondary market and found a place as a dependable starfighter among planetary defence and private military groups across the galaxy.